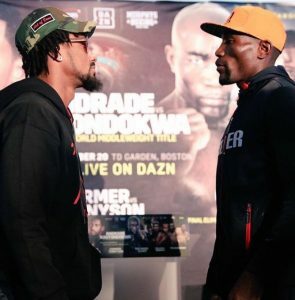 Major boxing returns to Boston on Saturday as Demetrius Andrade (25-0) faces Walter Kautondura (17-0) for the vacant WBO middleweight title strap. Andrade was originally supposed to face England’s Billy Joe Saunders, who won the belt after dominating David Lemieux last year. Saunders tested positive for a banned substance, however, and found himself without his title and without the ability to fight in Massachusetts. Therefore, Andrade will be facing a less well known opponent in Kantondura on Saturday, a knockout artist with a perfect record. Should he win, Andrade can expect an interesting future, especially now that middleweight kingpin Canelo Alvarez has signed on with DAZN, which airs Andrade’s fights. Tevin Farmer (26-4-1) will also be on the card. He’ll be defending his IBF Super Featherweight title against James Tennyson (22-2). Farmer, who is happy to now be teamed with DAZN, Eddie Hearn, and Lou DiBella, has his eyes on the future, but remains focused on Tennyson. ““I have a big fight on Saturday,” says Farmer, “and I’m not over-looking James. You don’t get to this level for no reason and I know he’s going to come to fight and try to beat me, but that’s not going to be easy – he needs to make sure he brings his A-game.” Should he emerge victorious on Saturday, Farmer has another known fighter in his sights. “I want to fight Gervonta Davis,” he says. Ireland’s Katie Taylor (10-0) will be fighting as well at the Garden this weekend. Making her third appearance in the United States, Taylor will be defending her WBA and IBF lightweight titles against the 27-5-3 Cindy Serrano of Brooklyn. Taylor is particularly pleased with the fight’s location. “The fact it’s in Boston means it’s going to be like a home from home for me in there with all the Irish support,” says Taylor. England’s Kid Galahad will likewise be fighting on the card. The undefeated 24-0 Englishman will face the 25-1- Toka Kahn Clary. Both men will walk into the scheduled 12 round match with much to prove. An impressive win will help move the victor along in his career. Clary, who fights out of nearby Rhode Island, may have the advantage of having the live crowd before him. Yet Galahad is looking to impress as he makes his American debut. The fights will air live on the DAZN streaming service beginning at 9 PM eastern standard time on Saturday evening.